After a sad day with the Veto Meeting on Big Brother 2014, it looked like we have to prep ourselves to say goodbye to Donny this week on Big Brother 16….or do we??? We still have plenty of time before Thursday night and Donny is definitely going to try and get people to change their minds, even if it is to send his friend Nicole back to the jury house. Check out the highlights from Monday below in our Big Brother 2014 spoilers! It was a quiet day in the Big Brother 2014 house, but it looks like we have lots of people talking game and where we go from here. I have come to the conclusion, as we have all seen with her crazy antics in the Diary Room and when voting in front of Julie Chen, but Victoria is nuts. She is a child and jealous of the other girls in the house. She now seems gung-ho on getting Christine out because of her relationship with Derrick. It seems Derrick got confirmation from DR that their play was a success for Team America. Seeming we have not voted, that cannot be true. Maybe it was a success in that it will be what we vote down? So, Donny remains the target for the week, but Frankie was suggesting that production may have hinted to him about keeping Donny around this week. Him and Derrick talk and they know he won’t come after them next week and Nicole might and the paranoia kicks in about Nicole. They eventually think she will win HoH for sure next week. Nicole is doing some campaigning of her own and trying to stay in the game. To be honest, whoever does stay this week could stay a while longer. It seems like Christine is making more and more waves with people and they might want her gone sooner than later, so she could be out the door next week! Then it would be Donny or Nicole (whoever is left) and then Victoria (at least according to Frankie and Caleb, who think she will be drug to the end if they don’t get her out by F6). Right now, I don’t even know who will stay and who will go. The HGs have to be thinking that an endurance comp for HoH has to happen soon, so Nicole would be favored over Donny in that one. Nicole has some HoH wins under her belt and they don’t want her HoH next week, so it could very well be Nicole being evicted for the second time and Donny avoiding it for the millionth time! Really? “So, Donny remains the target for the week, but Frankie was suggesting that production may have hinted to him about keeping Donny around this week. ” Why is he talking so much to production. This has to be fixed. On Bbad last night, Frankie actually, said that he was “hinted to” keep Donny. And then BB said he was not aloud to talk about his DR sessions. Everyone talks about production and their DR sessions and it normally goes to Fish on the live feeds. They aren’t allowed to talk about it and then get cut off when they do. It is not just a Frankie thing. And production gives all of them hints in the DR, not just Frankie. Nothing is rigged. I’m sorry Todd, but after this season, I’m not convinced. For all of BB15, I had to sit and listen to people say that it was rigged for Amanda to win and she was friends with the casting director and she was going to win and it was all fixed. How did that turn out? How can you get 16 people to agree to be on a show knowing that the whole thing was fixed for one of them to win it? You may not like Frankie, but how is production hinting at saving Donny this week making it fixed for Frankie to win? It may not be fixed for any certain house guest to win. But there seems to be a whole lot more of production influence than I would think there should be. I agree with you, Kesha! Now as for adding little hints and suggestions along the way, well, yes, that is definitely a possibility. This season has actually been pretty boring with the exception of having Zach around to shake things up. The votes have pretty much been unanimous (they may all have been?!) and Frankie is obviously the darling of CBS which makes people want to vomit. Opinions wil differ of course, but I’m ready for some unpredictability. I’m seriously hoping either Nicole or Donny (whichever remains) wins HoH next week or there will be not much suspense left at all. You say potato I say patato. Totally agree with you Todd. Yea, I agree, Todd. I think CBS is 100% about ratings. They don’t care if Frankie wins – though they’d try to help him stay if it helps ratings. Same way they’re trying to “help” Donny now. They just want a highly-rated TV show. No conspiracy there. Yep, they are definitely stirring the pot but I don’t think they cooked up the dish completely before putting it on the air. Right, Todd–the only way they could do that would be to hire actors and pay them a salary. I don’t think they would dare to do that. I am sure you are much too young to remember the quiz show scandals several decades ago but that is the kind of “fix” you cannot keep secret. And “payola” was another media scheme that didn’t stay hidden forever. I think Todd has to say that or he will get in trouble. hehe 😉 We love you Todd!! What is going to be said when over 1000 people surround the BBhouse if Donny gets booted? At least four places on the net, all saying the same thing. and this I would love to see!!! wish I could be a part of it!! After reading all these comments I just want to puke. Surely “production” and Frankie aren’t talking about what to do. I can’t stand him. I am so sick of this show this season. I say I’m not going to watch it but I do. Nobody has a brain and Derrick is leading everybody around like little kids. And Frankie thinks it is his show. Beast mode cowboy thinks he is Gods gift to women and they all want him, Cody thinks he has the body from heaven and Christine is a ho. And Victoria, well Bless her heart, she is just plain dumb. And poor Donny tries to tell the air heads what is going on and they so dumb they can’t understand. I hope it will be like what lobsta-man said. 1000 people surround the house if Donny gets the boot all saying the same thing. CBS is this fixed??? I wonder if Cody’s going to ask Derrick for his pe nis back after the game or if Derrick’s just going to keep it? I think it will be Donny then Nicole then Christine then Frankie then Victoria then Caleb then the final 2. If Donny and Nicole leave, I hope sooo much Victoria wins the big money. If they leave Mary, I don’t think I could waste anymore of my time watching this fixed show. Anyone but Victoria! She’s a pig! Did you notice her “hygienic” manner of Food Preparation on BBAD last night? Disgusting! She is disgusting but if she’s at F2 I want her to win. No way do I want Derrick to win or Frankie(nstine) YUK!!! I saw that too. She would lick her fingers put the stuffing in lick her fingers and do it again! With all that infection in her mouth (remember she is on antibiotics for infection) I for one would not eat those mushrooms. She gives me the creeps with her spooky stares, constant mumbling, making no sense and just drifting from one place to another. Victoria does not stand a chance of winning—nobody will vote for her. Now I think America’s favorite will be either Frankie because of all his followers or Donny. Caleb thinks that it’s either him or Frankie. not that I want this to happen, but I think it is Derrick’s game to win. I couldn’t stop laughing when Caleb was saying how he would be America’s favorite. He thinks he is the best at everything. He is in for a rude awakening. Amen to what you said about Caleb. Victoria win the big money for what? She hasn’t done a damn thing in this game. I think Victoria is jealous spoiled brat but I can grit my teeth and say I hope she wins to if Donny and Nicole leave. I just want look at her. At least it’s not another picture of Frankie(nstine). Hallelujah! I did watch most of BBAD mad was disgusted. I cannot stand Victoria, she is a pig! There is no way on earth that I would EVER eat anything that she cooked. I worked in Food Services at Six Flags for 3 years and we NEVER handled food without wearing gloves, but, in your own home you aren’t expected to, but under no circumstances, unless it’s your own meal, should you touch that food AFTER licking your fingers! I watched her put that stuffing in the mushrooms by scraping the filling off the spoon with her fingers, lick her fingers, then pat it down into the mushroom. Like Imsaid, I have experience in Food Services, which is probably why I noticed it. I almost gagged when she gave some of them to Derrick and he was eating them. Then she had the nerve to say she’d been cooking since she was 12! That tells me that she was taught wrong, because I was taught how to cook, in the 60’s, when I was 10! And it was stressed NEVER to use my fingers or to put my fingers in my mouth, then onto food, and if you have to use your hands? Wash them often during food prep! I did not see her wash her hands once while prepping that food. Now that is gross… She is a pig. Hmmm, did Derrick get food poisoning? No? That’s too bad! I truly not like this at all, this season has brought the worst out of me. I think most of us would say it has done the same for us, too. Thank you for the best diet tip I have seen in a long time. Now every time I am tempted to overindulge I will just bring that picture of Victoria stuffing the mushrooms to mind–that should take away my appetite! If you worked for a Six Flags, then you know that as soon as the food hits 165 degrees, boogers gone! At least she is doing it on camera, who knows what takes place unseen in food establishments? I do agree she is not a nice gal, I even think she is much less. BB NEEDS to force them to wear gloves around food, especially chicken. I think they said about trying to save Donnie during BBAD to look good to us in order to increase their chances for America’s favorite player. They do not want us to hate them. Too little too late for me! Plus CBS probably knows how us fans are feeling and giving us false hope just like they did before. They love to do cliff hanger type stuff just so we will watch the next episode. It would be great TV if Christine won HOH and instead of a letter from her husband she received divorce papers. Her behavior for a married woman is deplorable. I don’t care if this is a “game”. Seeing Christine in the HOH room would be a real gag-fest but that little “gift” might make it worthwhile! I’m not convinced Donny will be staying. Derrick and Frankie talked several times yesterday about Production hinting at saving him. But it’s a catch-22 for both of them. I think they both have come to the realization that America loves Donny more than them. And ousting a TA member would reflect poorly on their game. It’s no surprise that Production would drop hints about a strategy that would boost their ratings. They’ve done it before. But here is what tells me that keeping Donny is not exactly a done deal. 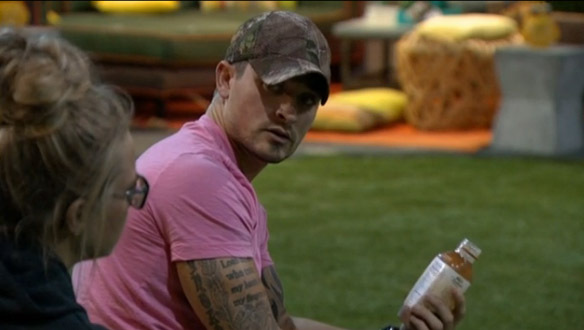 Derrick told Frankie that they needed to get Cody on board to boot Nicole instead. Even though Cody doesn’t get a vote. Cody nixed the idea. Then they talked about convincing Caleb. So far, Caleb is not on board either. But here’s the thing – If they really wanted Donny to stay all they would have to do is for Frankie, Derrick and Victoria to vote to keep him. We all know Derrick could convince Victoria easily. That would leave Christine and Caleb to vote for Nicole. But for Frankie and Derrick to go against their alliance at this point is not good for their games. Production has planted 2 seeds in the garden and are watching them take sprout. One is hinting at Derrick and Frankie that America is not happy. The other is hinting to the fans that they are doing everything they can to give us what we want. Both things could have been accomplished with one simple solution – either allow a DPOV, Pandoras Box or a coup d’etat to be brought into play (by a fan vote) With Donny being the holder. Or they could lock the door (its been done before) and save both Nicole and Donny this week. This wrangling for votes would not have been necessary and fans would have been doubly excited. And Derrick and Frankie would still be shown the light that America (and Production) wants Donny to stay. Derrick still may use his dust to convince the others. But i don’t expect him to be happy about it. JMO but i think Production is using some dust of their own. Now lets see if Frankie and Derrick inhale it. I would be so happy if they just locked the doors and kept them both 😀 😀 😀 Oh Happy Day! I agree, they need something. This frigging year has to be the worst in my eyes. At least last year they kept it exciting this year all I want to do is sleep during the show. I will take a coup d’état, please! As a matter of fact, they are so good, I would take 2 and will pass them along to Donny AND Nicole. P.S. I will pull out my dust mask, too! Thank you for the warning! Very interesting theory about production WANTING us to think they are trying to influence Derrkie (sounds good for those two, doesn’t it?!). Now that you put it into words, I agree completely. My first instinct last night was that production jumped awfully quickly when Frankie said “it’s been hinted to me.” In fact, that’s all he said – he’d already finished his sentence – so production announcing “you are not allowed to talk about your Diary Room sessions” actually called attention to it. I have to mute my TV every time Nicole speaks because her voice is so annoying!! I feel sorry for patients if she truly wants to be a nurse because the way she panicked with Victoria was not good. Doctors, nurses, pilots NEVER need to say OH OH! LOL! Thanks for injecting some humor into my morning. I am having a brain freeze right now and trying to remember the TV commercial with the man saying, “Uh-oh” that was on not long ago. It’s going to drive me crazy until someone remembers it for me. was it the Insurance commercial? the one that protects against mayhem? Pretty sure that wasn’t it but some of those were pretty funny and good employment for Hollywood stunt men! Jo, it was an insurance company but not the mayhem one (All-State) — it was Geico but your insurance clue got me thinking and searching. So thank you! Was it the one for Bushs Baked Beans? It ends with him looking down at his dog and saying Uh-oh. Does Geico sell insurance in Canada? If not, I think all their ads are on YouTube–my favorite is this one but running strong in 2nd place is the “Hump Day” ad with the camel. I keep seeing commercials for Frankie(instin’s) sister’s new album now on sale in stores. Hmmm, so much hype in my opinion and yes, I’m not convinced this season isn’t fixed to promote her new album. I have no idea what label she is on but wouldn’t it be shocking (not!) to find out it is somehow affiliated with CBS! hmmm, interesting indeed. I’ll have to see what I can find out. it’s on the stock market. So it gets even thicker. We are all going to need waders to get thru this BS season by the finale. OK, can somebody help me? I posted this in a reply to Lobsta-man but wanted to put it where everybody would see it. You all know how it is when you get a certain song in your mind and you cannot remember the title–crazy-making! Well, something brought to my mind a memory of a TV commercial not too long ago that ended with a man saying very quietly, “Uh-oh.” I can picture him in my mind and even “hear” him but cannot remember what the commercial was for. I have done a little searching but so far, no luck. Anybody know what I am talking about? Drawing a blank, Tessa, sorry! I have loved so many of the Geico ads and would love to meet the team that comes up with the ideas but they probably don’t let them out of the room with the padded walls very often. From your mouth to GOD’s ear………..
Are you talking about wanting Donny to stay for at least one more week? The best thing I have seen since the last show is the promo where Donny says his fate is in the hands of these morons. That totally surprised me coming from him. Too funny!